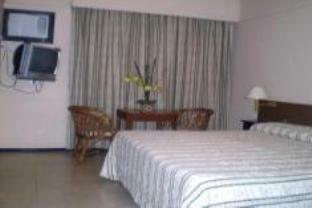 실내 및 야외 수영장을 자랑하는 Hotel Colonial Iguaçu는 포스 두 이과수에 위치한 숙박 시설로, 국립공원과 유명한 포스 두 이과수의 폭포에서 도보로 1~2분 거리에 있습니다. 공용 공간에서 무료 Wi-Fi가 제공되며 구내에 무료 전용 주차장이 마련되어 있습니다. Hotel Colonial Iguaçu의 편안한 객실은 에어컨과 전용 욕실을 갖추고 있습니다. 수페리어 객실 유형에는 케이블 TV도 구비되어 있습니다. 이 호텔은 놀이터, 게임룸, 피트니스 짐 및 바비큐 시설을 보유하고 있습니다. 매일 아침 조식당에서 조식 뷔페를 즐겨 보십시오. 조식은 각종 신선한 과일, 빵, 냉육, 다양한 종류의 따뜻한 음료와 시원한 음료 등으로 구성되어 있습니다. 참고: 호텔은 브라질 쪽 포스 두 이구아수 공항과 호텔 사이를 왕복하는 정원 10인의 무료 셔틀을 운행합니다. 이 서비스를 이용하시려면 "별도 요청란"란에 항공편 번호를 남겨주시기 바랍니다. 공항 셔틀이 필요하신 경우, 사전에 이메일로 호텔 측에 항공 정보를 반드시 알려주시기 바랍니다. 수영장 수건 이용 시 BRL2의 요금이 부과됩니다. 호텔에는 주차장도 마련되어 있으며, 가능한 경우에 한하여 추가 요금으로 이용하실 수 있습니다. 단체 예약(객실 6개 이상)의 경우, 별도의 정책이 적용됩니다. 자세한 내용은 호텔로 문의하십시오. 예상 도착 시간을 Hotel Colonial Iguaçu에 미리 알려주십시오. 예약 시 별도 요청란에 기재하거나 예약 확인서에 기재된 숙소 연락처로 직접 연락하셔도 됩니다. Thank you for kind & smiling staffs all the time :) I enjoyed the Iguaçu travel easily and room was also good. Even though the hotel is not near by down town, the buffet the hotel provides is pretty good :D. Thanks. 푸른 녹지가 좋습니다. 가격대비 만족스럽습니다. 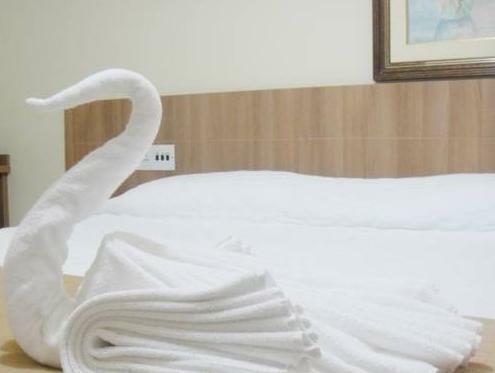 The hotel is extremely convenient to the airport and for the Iguacu Park. The hotel did not send the shuttle which I booked for my 3am arrival, and I had to take a taxi. However, they were very apologetic, and made it up to me by giving me a free shuttle ride to the park. The room was lovely, and breakfast was great. Good swimming pools for the kids, too. I stayed two nights here, and I enjoyed my stay. The wifi worked fine, there was hot water in the shower, and the beds were comfortable. Although windows in the bathroom were left slightly open by cleaning staff to allow ventilation, there were no apparent problems with insects (no mosquitos!) during my stay in August. The restaurant had good offerings at reasonable-for-hotel prices (the town and its restaurants are not walkable from the hotel). The Brazil side of the falls are a long, but walkable, distance from the hotel, and the hotel offers convenient, though a bit pricey, small bus tours directly to the Argentina side. I am a DIY traveler, but I am happy to have taken the hotel tour because it streamlined the border process greatly. My only problem was that I had to specifically contact the hotel to get contact info and confirm my (late at 10pm) airport shuttle pickup, but once I did that, they were there waiting for me and took me back to the airport after check-out. 5/5 stars, would stay here again! If you are just coming to see Iguacu Falls, this is the hotel for you. We walked to the falls and could have walked from the airport (but they had a free shuttle). A few little tiny ants but in Brazil that like saying there was air in the room. Nice breakfast, rooms clean but a bit dated. Nice shower with HOT water. All the staff are very good and they speaks goof english! The location is great, near the airport (convenient for late arrivals, early morning flights)and litteraly walking distance to the entrance of the park. Breakfast has a good spread. But, we had booked a double room and was given a twin bed. It took 2 days (out of 3 nights!) for the staff to change us room. Service recovery was satisfactory but took too long. Overall, pleasant stay and location is recommended! We stayed here with our 16 month old and it was a great experience to start off our holiday in Brazil. The staff is very friendly and helpful and the pools where great they had a pool to swim in, baby pool with a little slide and not very deep and then another pool with a water slide for the kids. Everything was clean from the rooms, restaurants and the pool. Would recommend this hotel to anyone especially with little kids. This place has everything you need - free airport shuttle, staff speak very good english and so do tours guide. The hotel is an exotic shack type, beautifully decorated, the rooms are very comfortable. The meals area is huge and very nicely decorated, breakfast is great, very big variety, the hotel itself has soo many attrations, outfoor heated pool, indoor pool, spa, table tennis...so many things to do you won't get bored-great for the family! We organised tours to iguaccu falls (both sides) and a samba show from the hotel tours guides. Everything was fantastic, and for SUCH a good price, we paid about $45US per night - mayeb the best hotel i stayed at in Brazil, beautiful with lots of character! 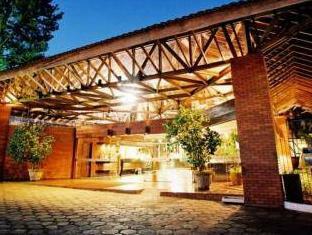 The hotel is just around 2km away from the Iguacu waterfall and the national bird park. Just ~20 mins walk along the road and you can get to the waterfall entrance easily. Breakfirst is great, internet is fast and the room is very clean and tidy. Walking distance to Iguacu Falls. Awesome breakfast. Minutes from Airport. The stay at Hotel Harbor Colonial was comfortable. The location of the hotel was amazing! Only minutes away from the airport, and walking distance to Iguacu Falls. The buffet breakfast was excellent - much better than many hotels that I've been to. Good selection and good quality of food. The rooms were standard, nothing flashy about the rooms. The hot water in the shower was a pleasant surprise (after learning that not many places offer hot water in Brazil). 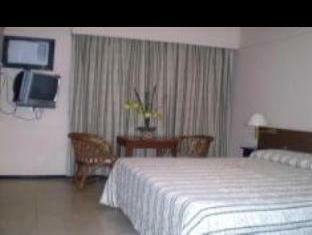 Overall it's excellent value for money considering the golden location and reasonable price of this hotel. There was not a lot of great things to say about this hotel. The sheets were stained, they charged a fortune to drive anywhere (1km to the Brazil side of Iguazu falls and they wanted to charge US$40 there, so we walked), and the entire hotel was full of insects. Overall I would not recommend. That said, it was cheap, so maybe I should have expected it. nao foi bom minha mae tem 70 anos e teve que descer escadas, so tinha rampa em uma ala e nao fomos colocados nela area de recreacao ruim, piscina suja pagavasse p tudo a internet no site diz que e de graca e se paga toalha da piscina paga tudo paga sem falar do transporte do hotel que e carissimo.